Read the Curtis Miner Architecture blog to stay informed on the latest in design and construction trends, project development, industry insights and internal CMA office news. Written by our expert professionals. Congratulations to Merrill Roberts for his recent promotion to BIM Specialist! Merrill has a long history of going above and beyond what’s expected to master the architectural craft. 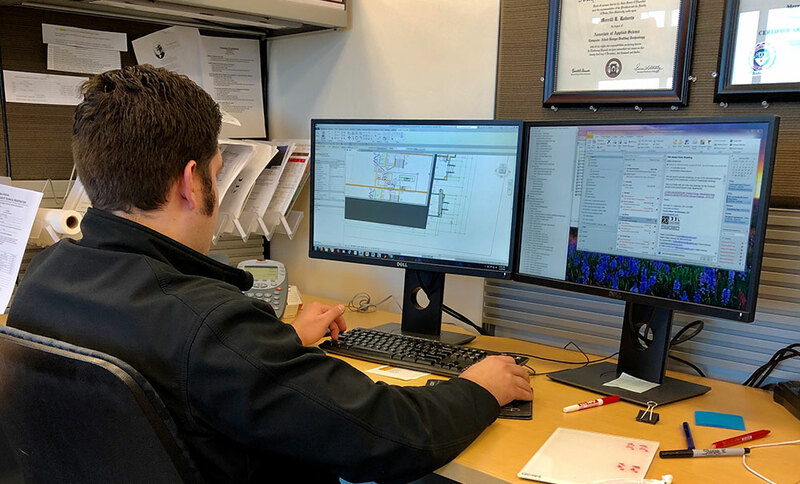 From getting to work early each morning to study BIM while in college, to continuing education in the Architectural Experience program, Merrill is truly a student of his profession. As a member of Curtis Miner Architecture’s Production and Design Standards Committee, he provides welcome support by training his co-workers. He belongs to our BIM team that understands and focuses on the unique architectural aspects of design, craft, and quality. He and the rest of the BIM team inspire each other to improve BIM design with new software that brings models to life through virtual reality. Merrill often has multiple projects on his plate. Some, like Rockpoint Apartments, a five-building complex with a clubhouse on a very steep site, bring out the best of his work ethic and architectural expertise. Modeling the 45’ drop from one end of the site to the other, along with the unique layout and stepping of each building, was a formidable challenge. With nearly six years at CMA, we are thrilled to have Merrill as part of our team and will continue to watch him grow in BIM and beyond.